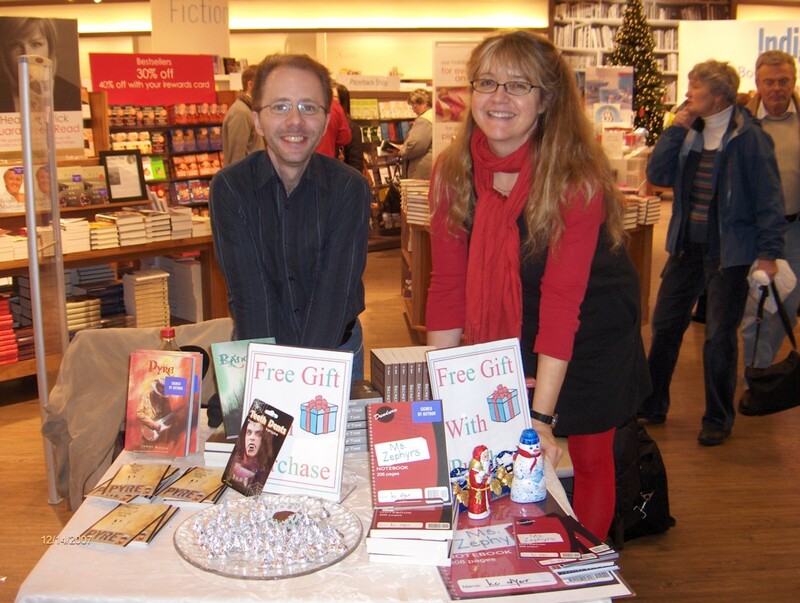 kc dyer and I had our first holiday signing at Park Royal Indigo in West Vancouver last night. Here are a few photos to share! There is one more signing to go! See the post below for information on our event at the Strawberry Hill Chapters in Surrey! Cybils nominees kc dyer and James McCann will be signing books at the Park Royal Indigo store this Friday afternoon (December 14th) from 2:30 to 5 pm, and at the Surrey Strawberry Hill Chapters store Sunday, December 16th, starting at 1:00 pm. We’ll provide the chocolate, you provide the chat! 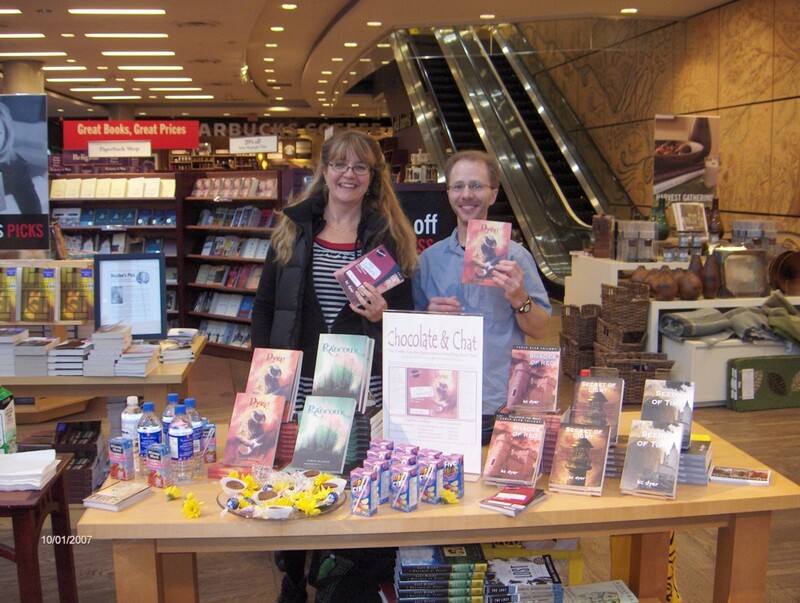 Join young adult authors kc dyer and James McCann as they show their appreciation for readers with chocolates, refreshments and their latest novels. 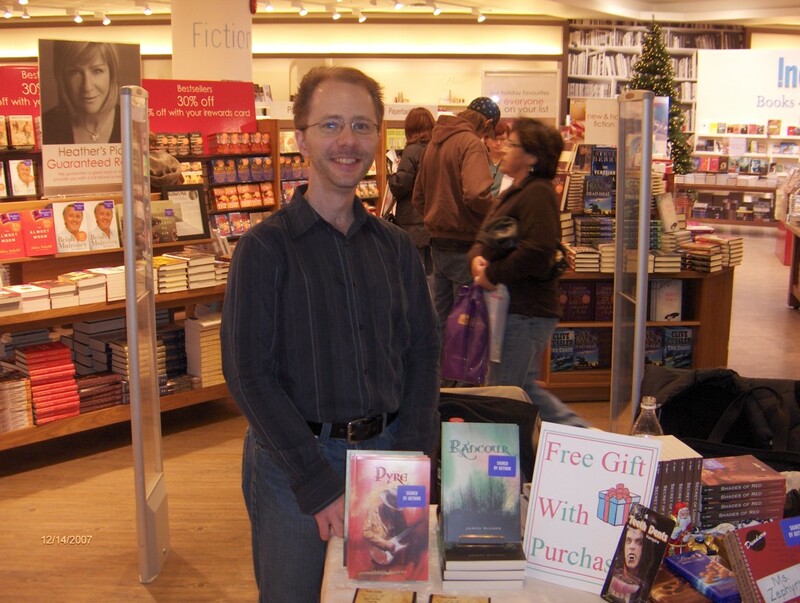 kc dyer is the author of the historical fiction Eagle Glen Trilogy SEEDS OF TIME, SECRET OF LIGHT & SHADES OF RED, and now the contemporary novel MS ZEPHYR’S NOTEBOOK. A former teacher, kc now spends her days surfing the time-space continuum for inspiring stories from both past and present for teens and adults. James McCann is the author of RANCOUR and now its exciting prequel PYRE. As a teen he read comics and played Dungeons & Dragons, both hobbies giving him the tools for storytelling. Now he’s a voracious reader, author and creative writing instructor. His goal is to write books that engage even the most reluctant-reader. kc dyer and I had our final four installments of the Terrific Teacher Appreciation Travelling Roadshow at Chapters across Metro Vancouver. The first two were on Sunday, and were in Surrey and Langly. The final two were on Monday, and were at Park Royal and Broadway&Granville. 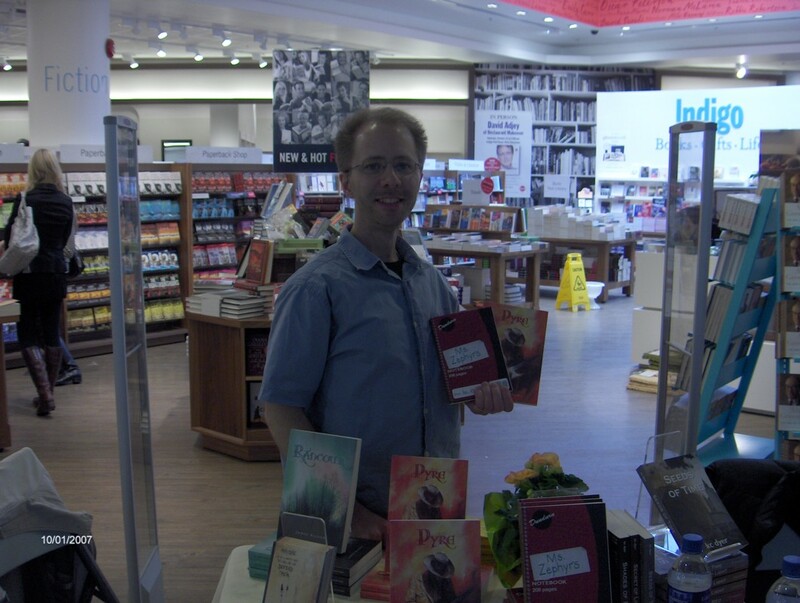 The staff at Chapters showed us a warm welcome, with a table filled with our books and announcements that let everyone know we were there. The days couldn’t have gone better, with kc and I finishing them off feeling on top of the world! 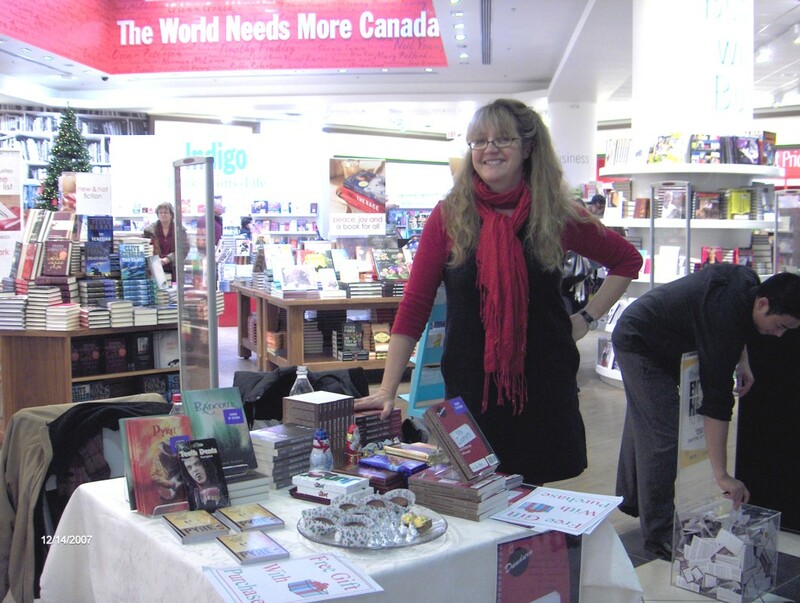 Come out and meet your local authors at one of Vancouver’s most lively literary arts festivals! CWILL BC will have a table promoting authors in your community. 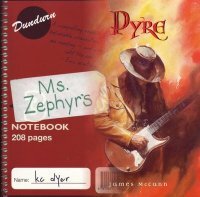 As well, kc dyer and James McCann will be reading from the children’s tent from 4:30-5:30 p.m., and will also be celebrating* their new books Ms. Zephyr’s Notebook and Pyre! 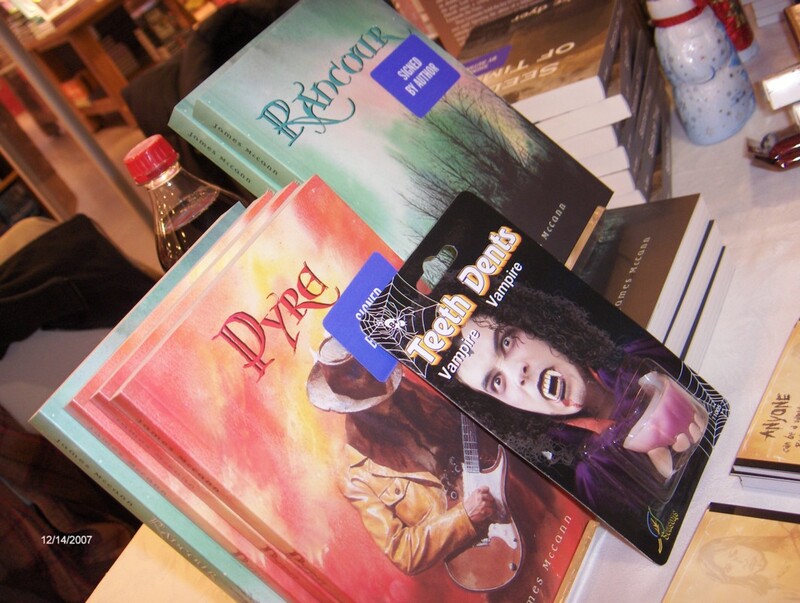 The Summer Dream Literary Arts Festival is an annual, engaging, outdoor festival established to raise public awareness regarding the on-going literary events, programs and resources available in the community. This year the festival will be located in beautiful Stanley Park at Lumberman’s Arch on Saturday July 21st from 12:00 to 7:30pm. This literary celebration will be comprised of performances by twenty literary groups, including multi-cultural readings in various languages, a Poetry Slam and a Story Slam competition to be judged by attendees. Entertainment will also include dancers and two local bands. There will be a children’s area with puppet shows, music, storytellers, face painting and a craft table. The Federation of BC Writers. *due to park regulations, books cannot be sold at the festival. If you’d like a signed copy, simply pick up your copy ahead of time from your favourite bookstore and bring it with you!